Religious and cultural obstacles are hindering Qatar’s efforts to conduct organ transplants. Reem Zubaidi and Aisha Al-Misned report. After suffering from cirrhosis of the liver for more than a decade, Qatar resident Raja Khan was preparing for the end – until last March, when he had a liver transplant that saved his life. Doctors said that without the operation, the 59-year-old would have had only two to three months to live. “They have given me a second life,” said Khan, who is recovering from surgery in Doha before he eventually moves back to Pakistan. Of the 80 people who suffer liver failure in Qatar, about a dozen are on the waiting list for a liver transplant. In the past, a patient would have had to leave the country for the complicated procedure. There are also 120 patients waiting for kidney transplants. As of yet, Hamad Medical Corp. is the only organization to offer organ transplants with the opening of its Center for Organ Transplantation in late November of 2011. Thus far, the facility has performed kidney, cornea and liver transplants, but pancreas transplants will soon be offered. Despite the establishment of the center, healthcare professionals say medical and cultural obstacles continue to hinder the progress of the program. “We have a long waiting list for the organs in this country. Unfortunately, we don’t have enough donors to give the organs. It is the shortage of the organ donors that is hampering our program,” said Dr. Muhammad Chawdhery, senior consultant of Organ Transplantation at Hamad Medical Center. The idea of organ donations is not very well received in Qatar, said Abdullah Firoze, a third-year medical student at Weill Cornell University in Qatar who, along with a few other students, began an awareness campaign in Education City. It is also not popular because of the lack of awareness among the population, he said. As part of the campaign, speakers were brought in “to correct some of the false perceptions that people have about organ donation,” said Rashad Al-Aani, sophomore student at Northwestern University in Qatar. In addition, posters and fliers were seen throughout Education City and booths were set up where people could sign up to become donors. The campaign has gained much attention from students. Zahed Bata, a communications freshman at Northwestern University, recently signed the form to become a donor. “On one hand, I have nothing to lose. On the other hand, other people have a lot to gain,” he said. Many Islamic scholars say it is considered a form of charity to donate organs to those in need, within reason. In Qatar, the sign-up procedure is simple. The donor only needs two witnesses and an ID to register. But convincing people to donate is harder. One purpose of the campaign was to show what religious experts were saying on the matter. Another obstacle is that of discussing the sensitive subject with family members who may one day find themselves in a position to sign permission for a deceased’s loved one’s organs to be donated. “We’re trying to make people decide earlier, instead of putting their family on the spot,” said Mohamed Al-Kazaz, a fourth year medical student at Weill Cornell University. To tackle this issue, Qatar is organizing a registry of the list of people who have donated or are willing to donate their organs after death. Also, residents who pledge to donate will soon be able to have their intentions printed on their personal ID cards and driver’s licenses. Meanwhile, the need for organs in Qatar continues to rise, in part due to the demographics of the country. Many patients who need liver transplants suffer from Hepatitis C. The liver-targeting disease is common here in Qatar because of the great number of travelers to and from the country, Al-Kazaz said. Diabetes is another disease that is especially widespread in Qatar and is a reason behind the high number of kidney problems in the country, according to the Qatar Diabetes Association. In a list ranking the number of diabetics in a country’s population, Qatar comes in sixth out of 223 countries and territories. Medical officials say that with diseases like these taking a toll on people’s lives in such great numbers, the need for organ donors is great. 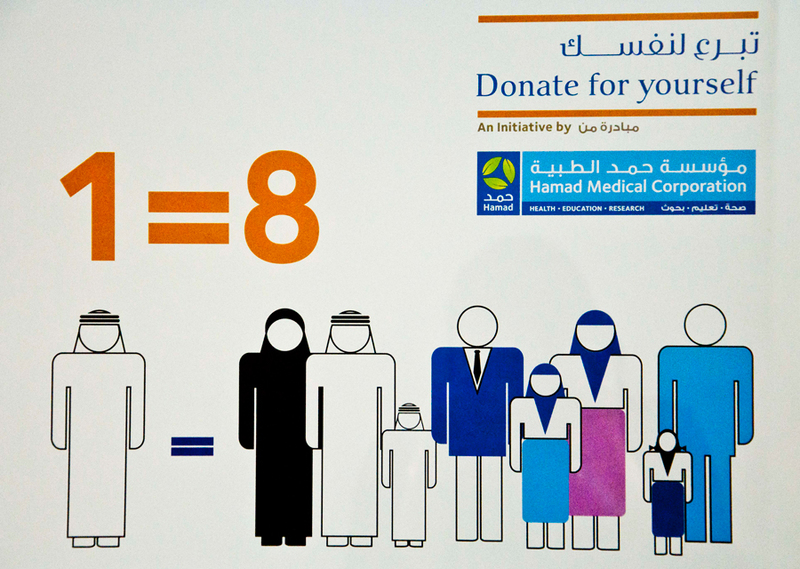 “One dead donor can give up to eight organs,” said Sahar Burhan, transplant coordinator at Hamad Hospital. Hi, usually you can sign up at Hamad Hospital, but since they are closed for Eid there are a few other locations: Landmark mall, Laguna and Hyatt Plaza. Timings are from 4 to 9 pm. Hamad Hospital used to have booths set up in public places like at a few of the malls around Doha. I don’t know if those are still there, but you can contact the Hamad Hospital transplant coordinator with this email address: smahmoud@hmc.org.qa. i wish to donate my organs,but im a non muslim .im living in qatar Muslim can accept my organ?i i wish to give a life to someone.